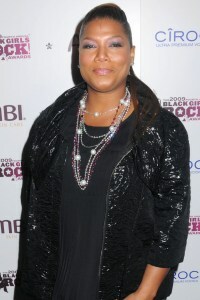 Has Queen Latifah come out of the closet and announced to the world that she is gay? A picture could be telling a thousand words as the entertainer stays quiet on the subject. Queen Latifah, actress, singer, rapper and businesswoman, recently celebrated the blessed nuptials between Swizz Beatz and Alicia Keys with the happy couple. But it wasn’t the happy couples’ holy union photographers honed in on. It was the embrace caught between Queen Latifah and rumored girlfriend Jeanette Jenkins that sparked the idea that the multi-talented celebrity might be ready to address the gossip surrounding her love life. Reports are saying Queen Latifah, whose real name is Dana Owens, and Jeanette Jenkins were in France celebrating with Swizz Beatz and Alicia Keys when California overturned Proposition 8. The couple supposedly celebrated with a loving hug and that’s when photographers snapped the duo. The long awaited overturning of the irrational Proposition 8 might nudge a number of celebrities to celebrate by acknowledging a part of their lives that is difficult to do in the spotlight. Now, SheKnows completely agrees that it’s an individual’s right to come out on their own terms and if Queen Latifah is indeed ready to take that step, good for her. If the photos are simply a friendly hug taken out of context, that’s completely fine too. No judgement here. But, let’s hope the press doesn’t take someone’s special moment away from them. Stay tuned for more news on this developing story as it becomes available.